Okay, people. The big news of the week is really big. In its effort to make genealogy interesting to innocent citizens of all races and creeds who have absolutely no interest in family history, The Church of Jesus Christ of Latter-day Saints has finally done it. Period. Even if you have never, ever, been interested in genealogy, this just might tip you over the edge. The name of the website is Relative Finder, and you can get there through this: http://roots-fb.cs.byu.edu/. You sign in with the same login information that you use to get to Family Search or other LDS websites. If you are not a Mormon, you can still create a free account that will (hopefully) allow you to get to the information. Once you get authenticated, you will see a "Getting Started" page, which will explain how to use the site. Near the top right of the screen, click on "Relatives." That will take you to another screen. On this screen, there is a list of categories of people who have been chosen to interest just about anyone. LDS Prophets. U.S. Presidents. People who sailed on the Mayflower. Famous scientists or explorers or members of royalty. Famous people. No matter what your interest, these insidious family history people have their claws into you. Oh yes they do. For example, I ("I" being your writer, Kathy Kidd, who, as a convert to the Mormon Church, had no business whatsoever of being related to any one of the Mormon prophets) clicked on Prophets. Then I clicked at the top on "Show Relatives" at the top. Bingo! I am not just related to one of them. I am related to all of them. The secret, of course, is that they go way, way back. 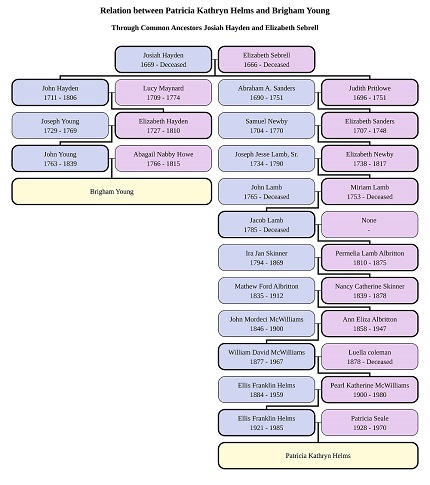 For example, I am Brigham Young’s 11th cousin 8 times removed, and in order to get the connection they had to go back to 1669. I don't know about you, but I don't have my genealogy done back to 1669. Well, here's the secret. They do. You click on "View Chart," and there it is — all of the relatives that connect you to a famous person. Spiffy. The work has been done for you. What more can you ask? Here’s the proof positive. I, a total convert with no Mormon connections whatsoever, am a card-carrying relative of Brigham Young. Well, people, he only had children with sixteen of them, but I’ll humor you. Joseph Smith wasn’t exactly prolific, but I am related to him, too. So there. They had to go back to 1398 to find a connection with our common ancestor James (Jacobus) Chudleigh, but they did it. Joseph Smith is my 23rd cousin 12 times removed. Here I am, in another guest appearance. Weird, or not so much? Lest you think I am bragging, Fluffy also checked out his lines and found out he is related to the exact same people, although naturally through different family lines. Either he and I are illegally married or there is something else going on here. What I suspect is that the people who designed the program picked out a list of names of people everyone would recognize and that most of us would want to be related to. Then they did the genealogies of those people all the way back to Moses or Noah or Adam or somebody else who was way back there. Then all they had to do, and I’m saying “all” here like it’s a little, tiny thing, is that they had to figure out where our family trees intersected with the famous people’s family trees and work back from there. See? Piece o’ cake! Some computer program scrubbed our family trees looking for key names that would link us in to the person in question. Once they made a hit — bingo! I have a friend who is a genealogy weenie — excuse me, genealogy buff — and she said it’s a known fact that Elvis Presley’s name came from Preslar. If you look for Preslar or Pressler in a family tree, that’s a dead giveaway. I’ve got both, and that was the computer’s red flag for that name. You can do that with all the names if you know what to look for, and when “you” is the computer, the search is easy. There are two things that make this website a real bonanza as far as I’m concerned. I do not care a bit about being connected to celebrities. Unless Jon Meade Huntsman wants to put his 14th cousin 4 times removed in his will, none of it makes a bit of difference to me. But I do care quite a bit about the genealogical value. 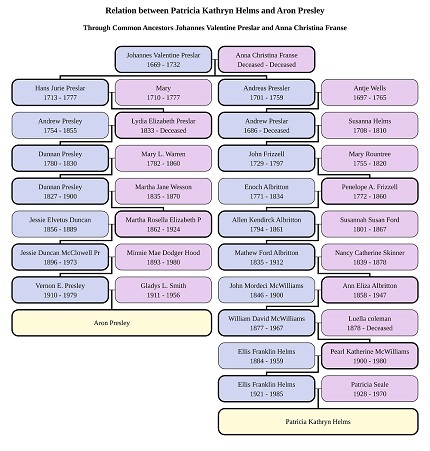 If you look again at that picture of my Joseph Smith genealogy line, you can see there are a lot of blank spaces on my side of it. Some of them look as though they would be pretty easy to fill. Now that I have names, I can use my new Ancestry.com membership to fill in a lot of blanks with those free pictures of birth and death certificates that Ancestry.com so conveniently provides. Every one of those names on the website — and there are hundreds and hundreds of them — give different genealogy information for me. I could spend the rest of my life filling in genealogy information from what was given to me for free from that website (checking it for accuracy first, of course). This is the most invaluable genealogy information I have ever seen. And the other big deal for me is the missionary connection. If missionaries struck up a casual conversation with people who were not otherwise interested in religion and were able to say, “I'll bet you’re related to Elvis Presley (or John Wayne or somebody else cool) and I can prove it,” they may be able to get a foot in a door that may otherwise be closed. I’m not saying this should be the first line of approach, mind you. There are cooler things about our religion than our dubious genealogical tie to Elvis Presley or Butch Cassidy. But everyone needs some conversation starter, and some people are initially impressed by one thing more than they would be by another. And hey — the King. Elvis! I’m not even an Elvis fan, but 10th cousin 3 times removed! That’s not just chicken feed! I cannot believe we are such close relatives. I do not even like peanut butter! The only caveat I can see is that right now, I think you mostly have to have ancestors of European ancestry. Later on — well, we shall see. If you're Asian or South American or African, stay tuned. I am sure they want their claws in you too, and they will find some way to connect you to Elvis. Try it out, people. And if you’re not a Mormon and don’t know how to get into Family Search, I’m sure you know a Mormon who can help you do it. If you don’t know a Mormon, have no fear! You can try registering through the Relative Finder website directly, or try this link where you can register with Family Search first: https://familysearch.org/register/. And if you get bitten by the genealogy bug, you can use your free account to do all sorts of research. If that doesn’t help you, here’s a website that will connect you with some young people on bicycles that will tell you everything you want to know: http://www.mormon.org/missionaries. There’s a little box you can fill in where you can say why you want to connect with them, so they can send you missionaries that will know the answers to your questions, too. See? Doesn't that look easy and fun? Now go check it out. If you and I are related, you can let me know by giving me the secret password. Just sing a snippet of “Love Me Tender” to me next time you see me, and I’ll know to put you on my Christmas card list next year.